13SA had been the lt:leading British marque, but was at its last gasp in 1971. In a final desperate attempt at survival, it unveiled a series of 250 and 500cc singles. The renewal began with the Barracuda and Starfire. Developed from the C15 of the 1960s, these attractive sporting roadsters had sleeved aluminum cylinders, redesigned and more robust engine internals and larger valves. All of which raised output to 25 hp at 8000 rpm, a 10 hp/ 1000 rpm advantage over the C15. 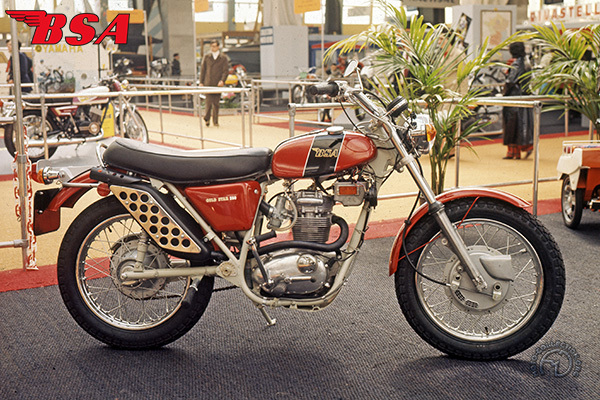 The B25SS and T325T off-road versions adopted the angular style of the latest Victor motocross bikes, and replaced the C2S in 1971. They were only in production for a year. The compression was raised from 9:5 to 10:1, giving a fut1her slight increase in power. Their excellent roadholding made these light 250s rapid and agreeable to ride. Virtually identical to the BSA 500, the new B25 250s adopted the same new frame (which had first been seen on the 1965 motocross 500), with an oil tank incorporated in the top and front down tubes. Unusually, the SS ("Street Scrambler") version – which revived the famous "Gold Star" name – was equipped with 18 inch wheels at front and back, following the American trend, and was available with either 6 inch or 8 inch front brake drums, 2.4 or 3.6 gallon fuel ranks. The B25T ("Trials") was a real off-roader, and it used the same powertrain, had a 20 inch front wheel, polished aluminum tank and smaller hub brakes. Though few were sold, the last BSA 250 was an attractive machine, with all the ingredients necessary for success.